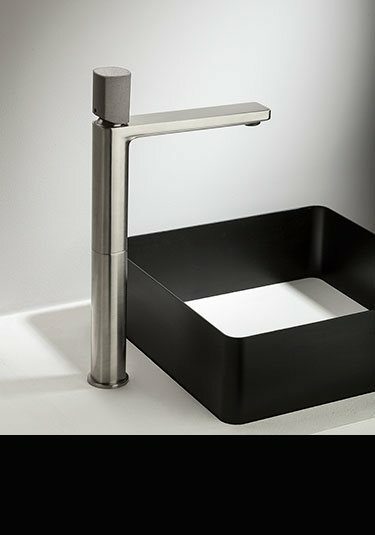 Unique European styling in a brushed stainless steel or chrome plated finish these exclusive basin mixer taps have real concrete operation handles which are treated to be highly stain resistant. This tall monobloc mixer tap is designed for deck mounting over countertop basins and wash bowls where an extended high tap is require. 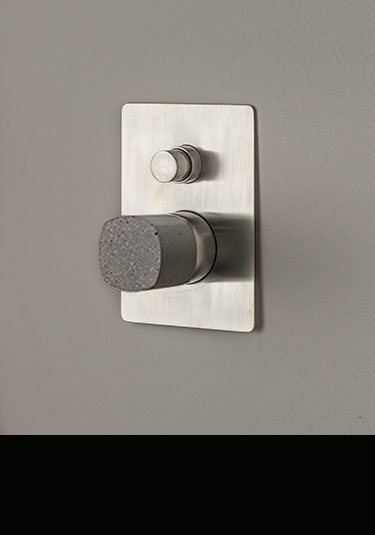 With its real concrete mixing handle and available in brushed stainless steel or chrome, this single lever tap is the latest in European styling. 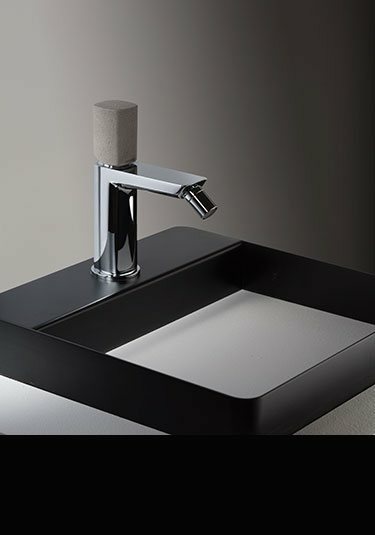 This wall mounted basin tap consists of a single lever mixer control with a contemporary styled water spout. 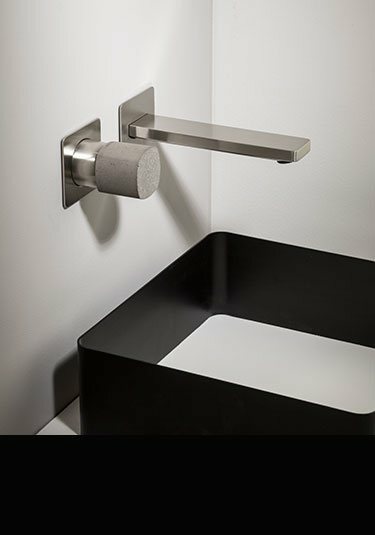 Shown here in brushed stainless steel but also available in chrome, this wall tap set is unique because of its modern & exclusive concrete mixer handle & is the latest European styling & superb quality. Available in brushed stainless steel or chrome, these contemporary wall mounted bath taps with handheld shower head makes a stylish addition to any modern bathroom design. 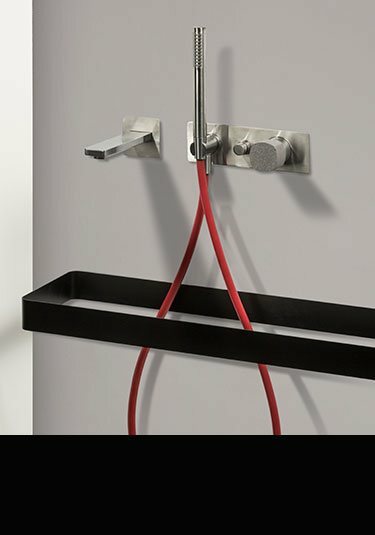 Each tap has an exclusive real concrete water mixing handle with the shower hose available in chrome, stainless black and red which makes lovely designer feature. 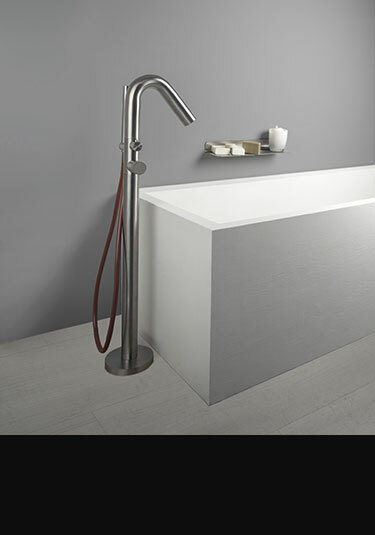 In the latest European styling this Italian freestanding bath filler is supplied in a brushed stainless steel finish with a matching handheld shower attachment. 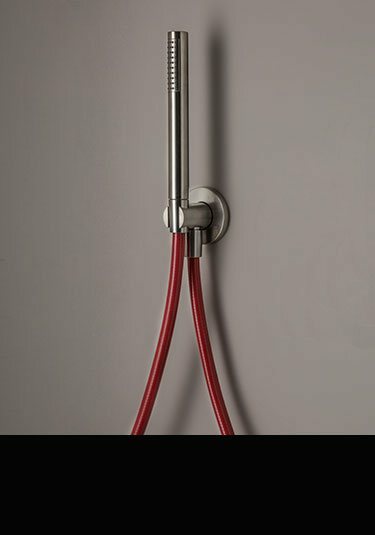 Each floor mounted bath tap is available with a choice of shower hose colours between red, black of a matching stainless steel finish. 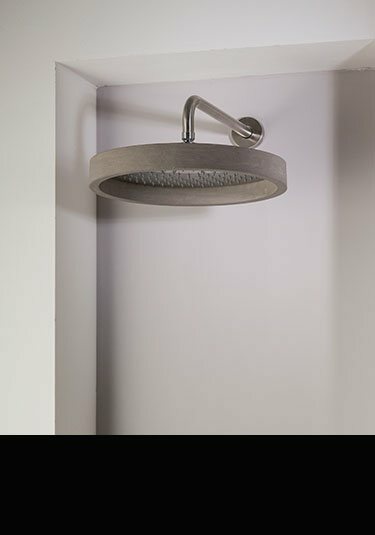 Stylish wall mounted shower head with a stylish and highly contemporary real concrete trim ring. This 338mm diameter fixed shower head is available in both brushed stainless steel and chrome. A designer wall mounted handheld shower with holder combined with the water outlet produces a neat and contemporary addition to the showering area. Also available with 3 shower hose colour choices. 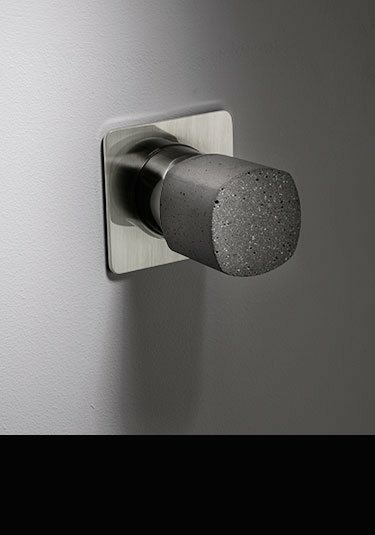 A stylish and contemporary single lever shower mixing valve with its unique real concrete mixer handle is supplied in both brushed stainless steel and chrome. This designer shower valve is the latest in European styling and lovely quality. Latest in shower control styling this 2 way multi-function shower valve is unique in its concrete handle design. Available in brushed stainless steel and chrome finishes this valve operated using a single lever for water mixing and switches functions via the diverter button. European quality recessed shower valve that can be supplied in brushed stainless steel or polished chrome. 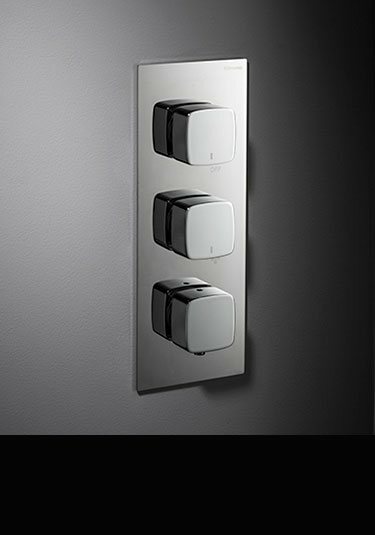 This thermostatic shower control valve is available for 2 way and 3 way operation allowing a multi-function shower. 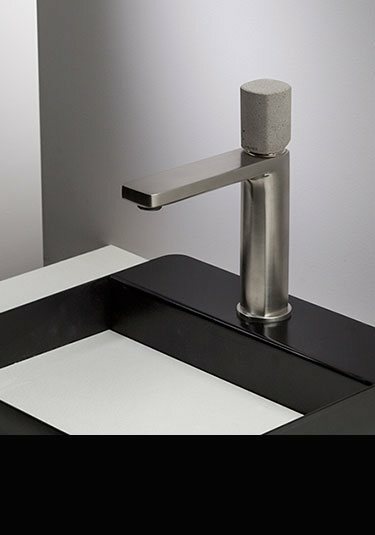 Highly contemporary with its unique real concrete mixing handle and supplied in brushed stainless steel or polished chrome this bidet mixer tap makes a lovely design feature in designer led high quality bathrooms. The Pau shower column has a large overhead shower head and is finished in an antique brass. Designed in the latest Italian retro styling and is superb quality. If you are planning a stainless steel themed bathroom one of the design issues is to have matching bathroom accessories for your taps. 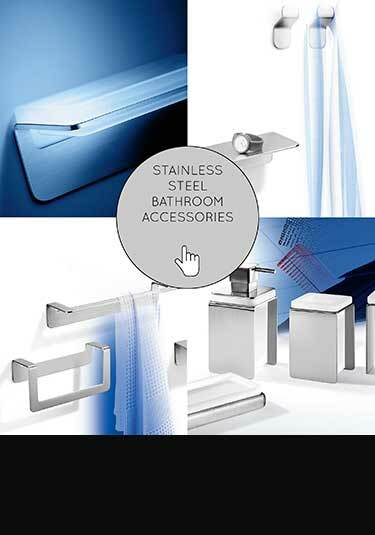 Livinghouse offer Italian designed and contemporary styled stainless steel fittings including tooth brush toilet, brush toilet roll holders and matching towel hanging bars.